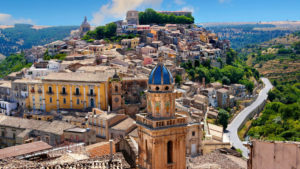 The name of the city comes from the ancient Hybla Heraia, a Sicel town hellenized in the 6th c. BC that has been identified as the modem Hibla,Ragusa Inferiore, the oldest part, which with the older part, Ragusa Superiore, separated by valleys, forms the modem city. Heraia gave rise to the names Hereum, Heresium, Re’sa, Raccusa or Rag’s and, in the end, Ragusa. The various necropolises in the area indicate that the zone was already inhabited in the third millennium BC, and more intensively (oven-type tombs in the valleys) in the 9th and 8th c. BC. The arrival of the Greeks led to further development, thanks also to the nearby port of Camerina, q.v. The city was then occupied by the Carthaginians and later, without resistance, by the Romans who accordingly declared it a decuman city. From the 4th c. and five further centuries, it was dorninated by the Byzantines. In 868, after a series of raids, it was finally conquered by the Muslims, and later, when it passed to the Normans, it was assigned in 1091 by Count Roger to his son Geoffrey, who populated the city with Calabrians from Cosenza (which rerninds us of the multiple origins, near and far, of modern-day Sici1ians). With the Chiaromonte family in the 14th c., and until the 16th c., the city layout was redesigned, with the addition, here as elsewhere, of buildings belonging to the religious orders. With the Swabians, the Angevins, the Aragonese (who made it a County which was granted to Giovanni Prefolio, the local leader of the anti-French revolt of the Sicilian Vespers ) and later with the Cabreras and the granting of territories in perpetual lease in 1452, the city achieved a degree of development and prosperity that continued to increase with the passing years. When Ragusa was devastated by an earthquake in 1693, the new agricultural ruling class immediately decided to build a new city, beyond the valley, on the other hill, known as Patro, while it was only in 1730 that the old feudal nobility initiated the reconstruction of the destroyed Hibla, which had however maintained its administrative autonomy. The year 1838 saw the discovery of deposit of asphalt deposits, still exploited today. In 1865 the twin towns became autonomous Communes, but were again reunited in 1926 and jointly created Provincial Capital in 1927. If we walk from Piazza della Libertà, where the railway station is, we come to a building containing a hotel at the beginning of Ponte Nuovo (New Bridge): on one of the lower floors is the interesting Hyblean Archaeological Museum, with access from Via Natalelli. The museum is in six sections: Prehistoric section, Camarina, Sicel Archaic and Classical Towns, Hellenistic Towns, Late-Roman Settlements, and Purchases and Gifts. The material is arranged according to area of origin and in chronological order. Proceeding further, we come to the nearby Villa Margherita and, by way of Via Roma, to the Cathedral, dedicated to St John the Baptist: a stupendous construction initiated in the early years of the 18th c. and completed in 1760. The façade is broad and low, and the interior is characterized by its smooth columns. Vertical pilaster strips diversify the chapter house abutting on the apse wall. LOWER RAGUSA. Proceeding along Corso Italia, we come to Corso Mazzini, winding down and joiningRagusa Superiore to Ragusa Inferiore or Ibla, which can also be reached across three bridges (Vecchio or dei Cappuccini, Nuovo, and John XXIII) or by descending the hundreds of stairs of a long stairway, where it is possible to visit, on the boundary of the twin towns, the Church or Santa Maria delle Scale, built between the 15th and 16th c. and rebuilt after 1694. The church still contains some features of the original building, such as for example the three Gothic-Catalan portals in the right aisle and another refined and elegant Renaissance portal, in the last chapel in the same aisle. Further down through Iblawe come to Piazza della Repubblica which is dorninated by the Chiesa del Purgatorio, with a fine baroque portal in its façade. Proceeding from the Piazza down Salita Commendatore, we come to Palazzo Cosentini, built in typically exuberant baroque style, and the 18th c. Palazzo della Cancelleria. Here we can also see the Chiesa di Santa Maria dell’Itria, founded by the Knights of Malta in the 17th c. It still has its original campanile covered with ceramics from Caltagirone. It contains a canvas attributed to Mattia Preti representing St Julian. Continuing along Via del Mercato or by other possible routes, we now come to the Chiesa di San Giorgio, built to the design of Rosario Gagliardi between 1739 and l77S. The fine façade is characterized by tiers of juxtaposed columns; its central part protrudes outwards and upwards. There are three paintings by Vito D’Anna, displaying good workmanship. The Treasury contains various silver items of great value. Further along, and similar in shape to the Chiesa of San Giorgio although somewhat smaller, is the 18th e. Chiesa di San Giuseppe, designed by an unknown architect. The internal plan is elliptic. The church contains a 17th c. silver statue of St Joseph. The nearby Norman Chiesa di Sant’Antonino presents its original Oothic portal in the façade; the sacristy portal is baroque. Going left, we can admire a fine Trecento portal in the Chiesa dell’Immacolata; while near the ancient walls, known as the Byzantine walls, is the Chiesa del Signore Trovato, rebuilt in the 18th and 19th c. There is a fine painting of the Madonna del Carmine by Vito D’Anna in the Chiesa di Santa Maria di Valverde. The Chiesa di San Giorgio Vecchio, in Piazza G. B. Odierna, is of considerable interest. This church has a reentrant façade and a splendid Gothic-Catalan portal, with an altorilievo on the lunette representing St George Killing the Dragon; above this are the Aragonese eagles. Now we come to the splendid Giardino Ibleo, laid out in the 19th c. This garden offers a splendid panorama and views of three churches: the Cappuccini Vecchi, San Giacomo, and San Domenico or del Rosario (in a poor state of repair). The Chiesa dei Cappuccini, modest in style, contains three paintings by Pietro Novelli (Assumption of the Virgin, Apparition of St Peter to St Agata in prison, Martyrdom of St Agnes). San Giacomo, built in the 14th c., was restructured in the 17th c. The nave and two aisles w ere converted to a single central nave and the church took on a baroque air. The painted wooden ceiling is 18th c.